1723년 심감(心鑑), 신오(信悟), 득총(得聰)이 조성한 해인사 감로왕도는 17세기 전반에 조성된 불화임에도 구성이나 존상 표현 등에서 조선 전기의 감로도 형식이 많이 남아 있는 작품이다. 화면 구성은 제단을 중심으로 크게 상단과 하단으로 나누어지는데, 망자를 천도하기 위해 강림하는 불보살이 그려진 상단부분이 강조된 반면, 의식이 거행되는 장면과 천도의 대상이 되는 망자의 모습이 매우 조밀하게 표현되었다. 이는 조선 후기 감로도가 상단에 불보살, 중단의 의식장면, 하단의 망자 등으로 구성하는 방식과는 다르다. 상단을 자세히 살펴보면, 철위산을 표현한 산수를 배경으로 도량에 강림한 칠여래가 크게 강조되어 그려졌으며, 그 왼편 아래로 아미타삼존이 제단을 향해 내영하는 모습을 그려 의식장면과 자연스럽고 유기적인 관계가 이어지도록 구성하였다. 아미타삼존불 아래에는 의식을 거행하는 장면이 있으며, 제단 아래에는 금빛 발우를 든 아귀와 합장을 한 아귀를 배치하였다. 제단 오른쪽에는 번을 든 인로왕보살과 석장을 든 지장보살을 그려 지옥의 문을 깨 망자를 구제하여 극락으로 인도하는 일련의 이미지를 전달하고 있다. 화면 하단에는 천인, 왕후제상을 비롯하여, 전쟁으로 죽은 이, 우차에 깔려 죽은 이, 홍수로 죽은 이 등 다양한 죽음의 모습이 그려져 있다. 이처럼 해인사 감로도는 화면 구성이 유기성 있게 구성되어 있으며, 불보살을 비롯한 각 존상의 세부 묘사와 녹색, 홍색을 중심으로 분홍, 노랑, 청색 등이 조화가 뛰어나다. 또한 배경을 이루는 청록산수는 안견화풍으로 그려져 중앙화단과 불화간의 영향관계를 살피는데 좋은 자료가 되고 있다. 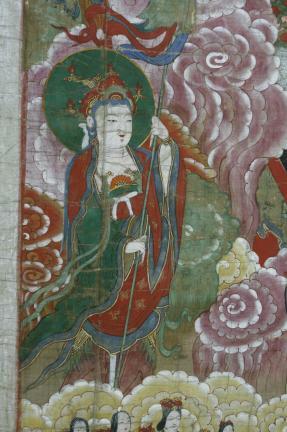 The Painting of the King of Sweet Dew of Haeinsa Temple was painted in 1723, by three monk painters; namely, Simgam, Sino and Deukchong. Although created in the early 18th century, this work shows the lingering influence of early-Joseon paintings of the King of Sweet Dew. The painting is in two sections, above and below the altar. The emphasis is placed on the upper section where several Bodhisattvas are arriving to lead dead souls to heaven. The scene of the rite before the altar and the dead souls in the rather cluttered lower section are depicted in miniature. This composition is quite distinct from the prevalent three-tiered composition in late Joseon paintings on the theme of the King of Sweet Dew in which the Bodhisattvas occupy the top tier, the ritual scene the middle tier and the dead souls occupy the bottom tier. The group of seven Bodhisattvas in the upper half of the painting, arriving at a Buddhist sanctuary, is set against a landscape of which one of the elements is the Iron Ring Mountain. 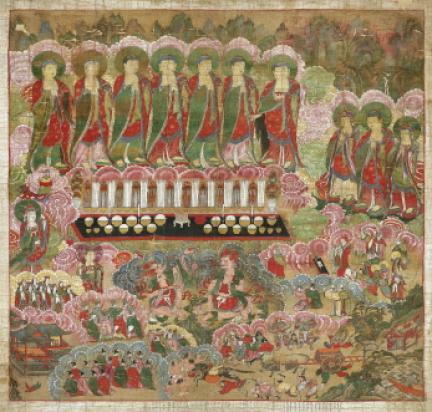 This scene naturally transitions into another one depicting a rite for the dead, shown below, on the left side, with the Amitabha triad appearing at the altar to receive the soul of the deceased. Below the altar before which the rite is being held, there are two pretas (hungry ghosts) with their hands gathered in a position of prayer, while holding a gold-colored bowl. 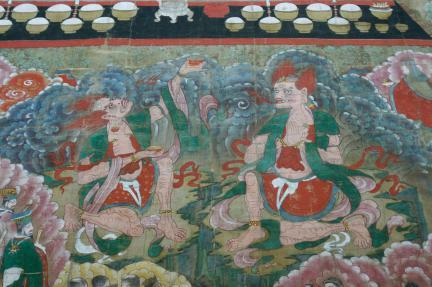 On the right side of the altar, Illowangbosal (Guiding Bodhisattva) and Ksitigarbha Bodhisattva, each holding a flag and a staff, are breaking down the gate of hell to rescue the souls of the dead and lead them to Paradise. Near the bottom edge of the painting, scenes of various types of death are featured, alongside the images of enlightened beings, kings and emperors, including death from becoming run over by an ox cart and drowning in a flood. This Painting of the King of Sweet Dew, remarkable for its balanced and original composition, is also impressive for its details and the great harmony between pink, yellow and blue tones. The landscape, meanwhile, is in the style of An Gyeon, indicating the existence of a relationship of influence between secular and religious paintings.